Now 23 years old, she's been a motivational speaker for seven years and has given more than 200 workshops on embracing uniqueness, dealing with bullies, and overcoming obstacles. She's a senior majoring in Communications at Texas State University in San Marcos, where she lives with her best friend. 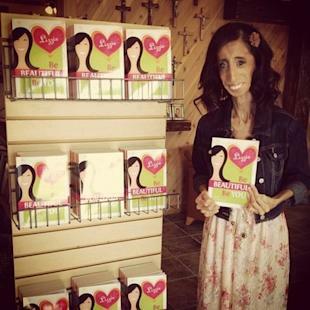 Her first book, "Lizzie Beautiful," came out in 2010 and her second, "Be Beautiful, Be You," was published earlier this month. "The stares are what I'm really dealing with in public right now," she told Dr. Drew Pinsky in an interview on CNN's Headline News this week. "But I think I'm getting to the point where… instead of sitting by and watching people judge me, I'm starting to want to go up to these people and introduce myself or give them my card and say, 'Hi, I'm Lizzie. Maybe you should stop staring and start learning'." "Some days life doesn't make sense," she writes in "Be Beautiful, Be You." "You just have to change what you can, ask for help and pray about the rest." She notes her triumphs and posts inspirational messages on Tumblr, and says that she's learned to embrace the things that make her unique. Instead of trying to retaliate against people who have made her feel badly, she sets goals for herself and pushes herself to succeed in spite of the haters. She's even reclaimed YouTube, video blogging about everything from bullying to hair-styling tips to staying positive. "I feel really glad that I don't look like the celebrities out there that are so beautiful," she told Dr. Drew. "There's a lot of stereotypes attached to that." Not looking like a supermodel "gives people the opportunity to know you personally," she explains. "If they're willing to take that extra step they'll get to know the person you really are." Of course, the horrible comments left on that old YouTube video stung (the video has since been removed, but Velasquez says she read every single comment). Now, she says, she understands that they're "just words." "I'm human, and of course these things are going to hurt," she said. "Their judgements of me isn't who I am, and I'm not going to let these things define me." "I didn't sink down to their level," she said in a follow-up video on YouTube last year. "Instead, I got my revenge through my accomplishments and determination. In the battle between the 'World's Ugliest Woman' video vs. me, I think I won."